Plant taxonomy classifies jack-in-the-pulpit as Arisaema triphyllum. Other common names include "Indian turnip" and "wake robin." Jack-in-the-pulpit plants are herbaceous perennials that grow from a corm. Although jack-in-the-pulpit plants flower in spring, it is primarily the spathe, a hooded, cup-like growth, that folks care about. This is the "pulpit" from which "Jack" (technically, the "spadix") preaches. The actual flowers are contained on the spadix, but they are not showy; it is the spathe that you notice from a distance, especially when it is striped and/or tinged with purple. The same holds true for the much larger snake lily (Amorphophallus konjac). Three sub-species exist, and there can be quite a bit of variation in coloration. The top of the spathe is a lip that curls over the spadix, as if forming a roof. Jack-in-the-pulpit reaches a height of 1-2 feet with a similar spread. Indigenous to eastern North America, jack-in-the-pulpit can be grown in USDA hardiness zones 4-9. Grow jack-in-the-pulpit in partial shade to full shade and make sure it is adequately watered and fertilized. These wildflowers do not demand the superb drainage that many plants do, making them an option for boggy soils. The idea is to mimic its native habitat, which is damp, acidic areas of the forest rich in humus. Fertilize with compost -- or with a fertilizer containing ammonium-N if your soil pH is not acidic enough. To plant, make a 6-inch hole in the ground in fall and drop in the corm, as you would for crocus, for example. Once the plants have come up in spring and put on some size, shovel 2-3 inches of mulch around them in order to conserve moisture. Slug pests like to eat this wild plant. For tips on controlling slugs, see the advice on killing slugs contained in this article on another slug magnet: hosta. The three-part compound leaf of jack-in-the-pulpit may remind some of poison ivy ("leaves of three, let it be") at certain stages of the latter's growth. The leaf structure also resembles trillium's, which shares jack-in-the-pulpit's native habitat, as well as the nickname, "wake robin." 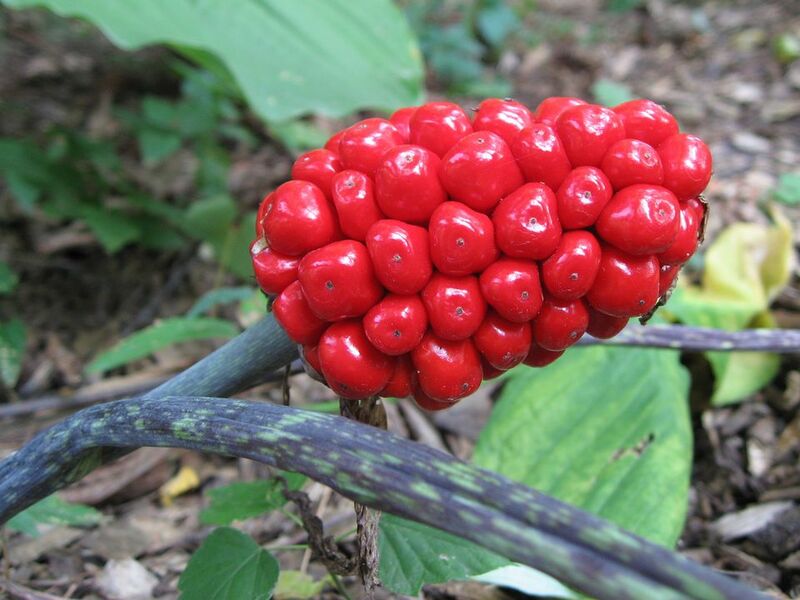 Jack-in-the-pulpits are poisonous plants, the corms (if ingested raw) being considered especially toxic. Native Americans cooked the corms after soaking and drying them, as preparation for both medicinal and culinary uses (thus the common name, "Indian turnip." But only experts should try this (Source: Doug Ladd's wildflower book, North Woods Wildflowers). Plant jack-in-the-pulpit in shade gardens and/or woodland gardens. In terms of design, many agree with Lorraine Johnson, who says of jack-in-the-pulpits in her native plants book that she prefers using them as accents, "a few here and there," rising out of a mass of surrounding low-growing ground covers. If you are concerned that dormant jack-in-the-pulpits will leave a hole in your shade garden in mid-summer, plant impatiens to fill in around them. Jack-in-the-Pulpit Reproduction: What&apos;s Going on Under the Hood? The Missouri Botanical Garden website explains that jack-in-the-pulpits bear only male flowers, at first, but that those destined to bloom "become hermaphroditic as they further age (male flowers on upper part of spadix and female on lower part)." Most jack-in-the-pulpits, this website goes on to say, enter upon a dormant period by mid-summer, "but the mature, hermaphroditic flowering plant will produce a cluster of red berries in mid to late summer which becomes visible as the spathe withers." The berries shine brightly and will add considerable luster to your shade garden late in the growing season. It is worth mentioning here some of the plant's close relatives (that is, other types of Arisaema), as well as some cousins. The spathe of A. consanguineum (zones 7-9) is purplish with light green stripes, terminating in a long "tongue" that makes it look ever so much like a cobra's head. Also with a long tongue is A. saxatile (zones 6-9), but in this case the tongue is the spadix; the spathe is white. The purplish spathe of A. griffithii (zones 7-9) is decorated with an elaborate light green veining pattern at the top. Arisaema plants are in the arum family. Other members include its neighbor in the woodlands of eastern North America, skunk cabbage (Symplocarpus foetidus), which is also characterized by a hooded structure that covers its flowers. Europe is home to a plant similar to A. triphyllum, called Arum maculatum; the plant even shares with A. triphyllum the common names, "jack-in-the-pulpit" and "wake robin." Whether you grow jack-in-the-pulpit plants or one of the other types of Arisaema, you will be treated to one of the more unusual plants you can grow in the shade garden. This is a plant that fascinates children and the young at heart, a plant not difficult to picture in a fairyland setting. One tends to feel that the namers of jack-in-the-pulpit failed to capture this magical quality. It is easy to imagine the lower part of the spathe as a drinking vessel abandoned by the elves, and the spadix as a pixie. The pixie, pursued by rivals, has discovered the abandoned vessel and hopped into it, pulling a leaf over the top for cover. What can one say? A. triphyllum is intriguing enough to bring the imagination out of anyone. Do you need more choices for shady locations? See this article on the Best Perennials for Shade.